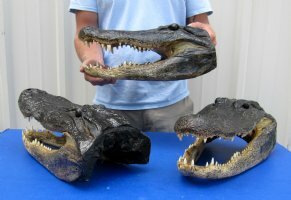 These wholesale Alligator Heads for sale are from approximately 10 foot gators and measure approximately 17 inches long. Wholesale alligator heads have between 74 and 80 teeth in their mouth at a time. As teeth wear down they are replaced. An American alligator can go through 2,000 to 3,000 teeth in a lifetime. Alligator head souvenirs are a profitable retail product for beach shops and souvenir and gifts stores catering to gator football fans, tourists, reptile collectors, teachers, students, and collectors of unusual items. A taxidermy process cures the alligator skin and the alligator skull so it will be preserved for years. 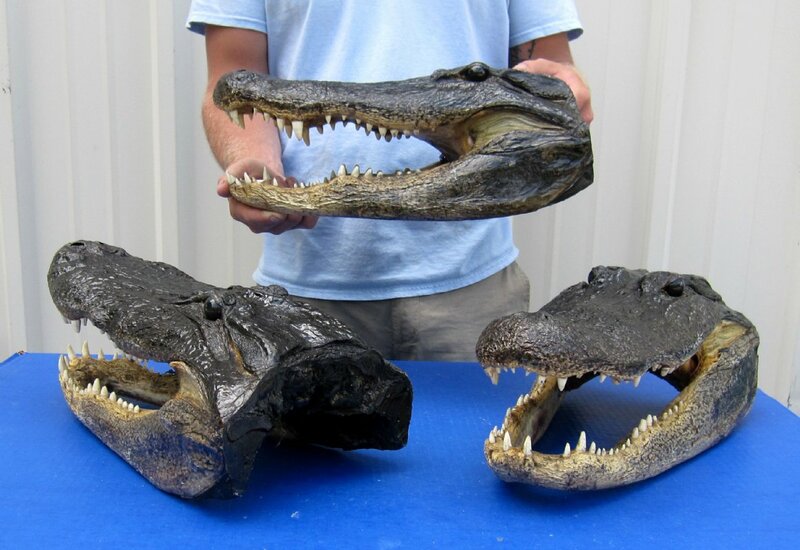 These gator heads may have missing/broken teeth, scars, scrapes, cuts, etc. These are from alligator farms and wild alligators! These are real alligators and will have imperfections due to fighting! These gator heads do not have felt backing - the open backs of the heads have been painted BLACK. There will be an odor from the clear sealant used on these heads. The odor will subside over time. You will receive gator heads that look similar to those pictured. No 2 will be identical.